In order to be sure that an actual person is filling out this form and to prevent spam, we ask that you enter the text from the image you see below in the code field. FREE Pickup & Delivery Service It couldn’t be easier to get top quality professional dry cleaning or laundry picked up and delivered to your home or office. Life can be very busy and saving time can make a big difference. 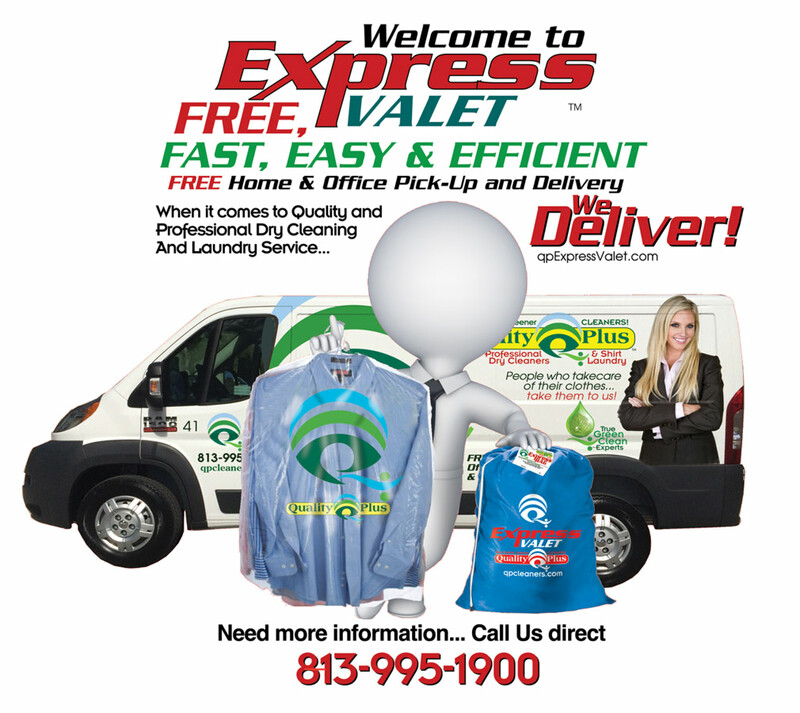 At Quality Plus, we understand and we’d like to help with our Express Valet Service. How It Works 1. When you sign up for a regular home or office pick up and delivery service, you’ll receive one of our sturdy Express Valet bags for your garments to be cleaned. Your personal valet will leave one for you each time your cleaned garments are delivered. 2. Put your garments to be cleaned in the bag along with order form and any special instructions and leave it at your designated location. 3. Your valet driver will pick up and deliver your items in two days. Twice per week, weekly, every two weeks or monthly, which ever schedule you want. There is NO obligation to have items every time the driver stops. We pick up and deliver even when you’re not there. 4. We process your order and return your garments freshly cleaned, pressed and ready to wear. 5. There is NO additional charge for home or office delivery. Your cleaning will be automatically charged to your VISA, MasterCard or American Express at time of service. Final invoice will be provided with your cleaned items. To Create an Account. Scroll down. FREE Pickup & Delivery Service It couldn’t be easier to get top quality professional dry cleaning or laundry picked up and delivered to your home or office. Life can be very busy and saving time can make a big difference. 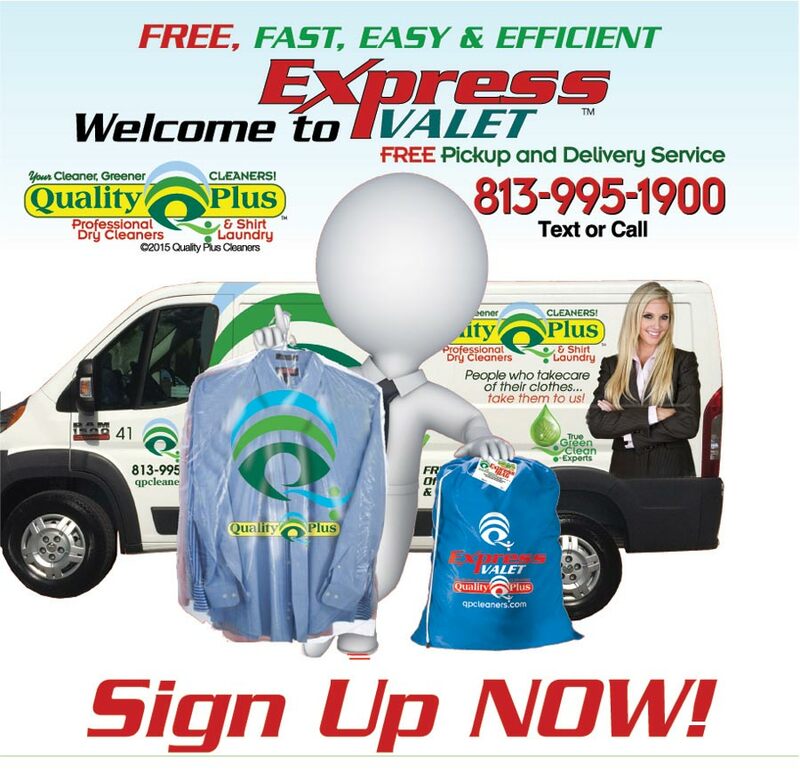 At Quality Plus, we understand and we’d like to help with our Express Valet Service. 1. When you sign up for a regular home or office pick up and delivery service, you’ll receive one of our sturdy Express Valet bags for your garments to be cleaned. Your personal valet will leave one for you each time your cleaned garments are delivered. 2. Put your garments to be cleaned in the bag along with order form and any special instructions and leave it at your designated location. 3. Your valet driver will pick up and deliver your items in two days. Twice per week, weekly, every two weeks or monthly, which ever schedule you want. There is NO obligation to have items every time the driver stops. We pick up and deliver even when you’re not there. 4. We process your order and return your garments freshly cleaned, pressed and ready to wear. 5. There is NO additional charge for home or office delivery. Your cleaning will be automatically charged to your VISA, MasterCard or American Express at time of service. Final invoice will be provided with your cleaned items. To Create an Account. Scroll down. In order to be sure that an actual person is filling out this form and to prevent spam, we ask that you enter the text from the image you see below in the code fieldz. A representative will contact you for more details.